Hey there everyone! 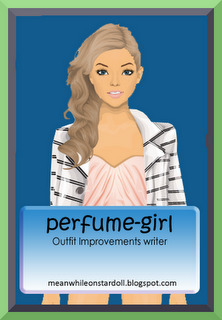 It's perfume-girl again with the Outfit Improvements section again! :D When I posted my first outfit improvement, I wasn't sure if anybody will like it, or if anyone will apply for an outfit improvement, but you did! And thank-you for that! The first girl, who applied was candycoolgal19 and this was her original outfit! I find this outfit really girly and cute, but I wanted to see elegance! So I took away these pieces..
And voila! There you go, girl, your improved, glamouros outfit! I used lighter colours, but the pink top still steps out a little, which I like. I loved it how she already accessoried her outfit, so I didn't have to add much. I matched the shoes and the purse, since they both have a little bit of purple on them. Also, I would like to say that I will be away for the rest of the month! I will create the posts, but I won't publish them, I will leave that to bracken1234 if she will be able to publish my post when the time is right! If you want me to improve YOUR outfit, you can sign up in the comments and I will choose someone for my next Outfit Improvement! If no-one signs up, I will choose someone myself, and the doll will stay anonymous. I already have 2 other outfit improvements ready (love-dulce & ilove2dress). Aw I'm sorry, I don't know why I was so sure it was 8! I will correct it right now! Wow, I love it :) !